I’m often approached by owners of yachts and people taking holidays on chartered vessels that would like to fish either for the table, for sport or a mix of both. So in part one of a two part series - I’m going to look at the kind of tackle you will need to get you started - and in part two I will look at how to set the gear up and how to fish. The kind of fishing gear I will be recommending is for targeting fish in the Mediterranean and Caribbean and not for the waters around the UK. That’s not to say you won’t be able to use it in our home waters but we don’t have the same pelagic species that are on offer in warmer climes. 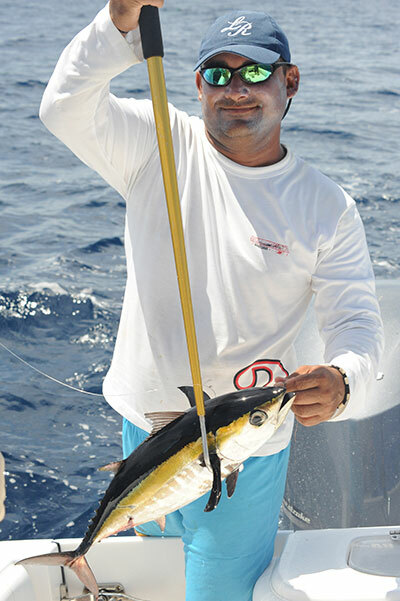 The type of fishing you are gearing up for is called trolling – you are trailing lures behind the vessel as it travels along. As with anything to do with this type of fishing it pays to go for stronger gear than would be used by anglers fishing primarily for sport. It will take longer to slow down/stop under sail so it pays to use gear that can handle the strain of a decent fish trying to swim one way whilst you are travelling in the opposite direction. This situation won’t necessarily end up in the line breaking as the reel will have an adjustable clutch that will slip, allowing line to be taken from the reel at a pre-set tension. With this in mind a 50lb stand-up fishing rod makes a reliable work horse. Most of these rods are short (5’-6’) and one piece. This may cause problems travelling and with storage so you might like to look at one of the travel boat rods we stock. The downside with these is they are not as robust as a single piece rods but the convenience may outweigh this for you. Multiplier reels are the best choice for this type of fishing – these reels are designed to be used on top of the rod, most wind from the right side. They hold good quantities of line for their size, have an easily adjustable drag system (clutch) and are generally more robust than the equivalent spinning reel. You get what you pay for but if you are on a budget we have some excellent reels with composite frames that will give good service. The most important thing to consider is the line capacity of the reel. To go with the 50lb Stand-Up rod I suggested you will need a reel that will hold at least 300m of 50LB breaking strain line. There are two main types of line on the market – monofilament nylon line and braided line. Braided line is made of a number of fibres woven together, its advantages are that it is very thin for its given breaking strain and it has very little stretch. Monofilament line has some stretch, greater abrasion resistance and is easier to knot. This makes monofilament a much better proposition for a novice angler. The stretch is a useful safety net for use trolling lures from the back of a yacht – it allows a margin for error. Skirted trolling lures – these come in a wide range of sizes and colours. Generally they have a head that can be a variety of shapes and weights that will determine how the lure swims behind the boat and the depth it travels at. A flat or concave head will cause the lure to stay near or on the surface creating disturbance giving predatory fish the impression of something trying to escape. A bullet shaped head will generate less disturbance but will keep the lure below the surface and allow the lure to be trolled at higher speeds. It may also be a ‘Jet Head’ this will send out jets of water as it’s pulled along the surface of the water. A flexible plastic skirt is attached to the back of the head – this will give a long slim ‘fishy’ profile as it is pulled through the water. It can be a variety of colours and patterns hopefully that will be attractive to predatory fish. These lures need to be ‘rigged’ – attached to a leader with a hook at one end and a loop at the other. We sell sets of rigged lures and can rig lures to your specifications. Diving Lures – these are solid bodied plug type lures with a plastic or metal bib at the front of the lure to make it dive when pulled along in the water. The size and angle of the bib will determine how deep it dives. You will also need some other minor items to set the gear up. Wind-On Leader – this is useful to give you a length of thicker, stronger line at the business end that will be easier to handle when you are landing fish. You attach it to the reel line with a loop to loop connection that will go through the rod rings and wind on to the reel. Ball Bearing Snap-Link Swivels – these are used to connect the end of the wind-on leader to the leader with the lure attached. The swivel will prevent problems with the line twisting. Crimps – Heavier monofilament line (above 80lb BS) is difficult to knot so you will find it easier to use the correct size crimps and crimping pliers to make connections. Use single-barrel alloy crimps for monofilament lines. Rod Holders – a purpose designed rod holder will give you peace of mind that your gear is secure – they can be mounted in the gunnels or attached to rails. There are a variety of types to choose from. Rail mounted rod holders are bolted on to the rail and will hold the rod at the correct angle for trolling. Fighting Harness and Fighting Belt – These two items are used to make playing large fish as comfortable as possible – they take the strain off your arms during the fight. We stock a good range of both at a variety of prices to suit all budgets. A gaff or net for landing fish. A priest to dispatch fish humanely with. A filleting knife and board for preparing fish for the table. A filleting glove to protect your hand from the knife while preparing and filleting fish for the table. If you have any questions or would like a quote for a set of gear tailored to your needs and budget please contact me either by email allan@rokmax.com or phone 01635 500399.